Many people think that sleep deprivation and sleep deficiency are the same thing but they are quite different from one another. Sleep deprivation is a condition which results from not getting enough sleep. Sleep deficiency is a much more comprehensive concept and can be a more serious problem. You have sleep deficiency if you do not get enough sleep and you sleep at times when you should not be sleeping, you sleep poorly, or you have some type of sleep disorder. Sleep deprivation is the condition of not having enough sleep. When you are sleep deprived, it can cause you to have fatigue, daytime sleepiness, be clumsy and have weight changes. It can affect your brain and cognitive function. When a person is sleep deprived many things can occur. There are many causes of sleep deprivation. The stresses of your life may affect our ability to sleep well at night. A person may also be sleep deprived because of medical or mental-health conditions that disrupt our sleep and be well aware that they are sleep-deprived. It is important to realize that sleep deprivation is often caused by unrecognized sleep disorders (such as snoring, sleep apnea, and restless leg disorder). After a night of sleep, you may be still be sleepy and not feel restored and refreshed. Most people are not even going to be aware that they are sleep deprived. This is why many people are undiagnosed for being sleep deprived for many years. More than 85 sleep disorders are recognized by the American Sleep Disorders Association, affecting more than 70,000,000 Americans. Sleep-related breathing disorders range from simple snoring to sleep apnea, and most cases remain undiagnosed and untreated, which is frankly quite scary. 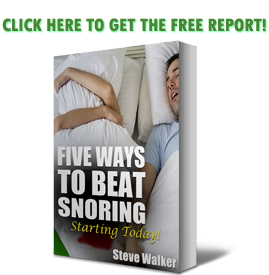 More than 45% of the American population have chronic snoring problems and half of those people have sleep apnea. Increased awareness is the first step to helping people with their sleep deprivation. Some of the effects can be very serious, which is why it is important to get diagnosed sooner than later. Sleep is so much more than getting a few minutes of shut-eye. Sleep is the time for both your brain and body to be restored and recharged. It should play a critical role in your healthy mental and physical functioning ability. Sleeping is vital for us to have good health and well-being throughout our lifetime. We all must get a good night's sleep every night in order for function properly throughout the next day. Sleep deficiency can lead to health problems, injuries, loss of productivity, and possibly even death. Your ability to function while you are awake depends on whether you are getting enough sleep. You also need to sleep when your body is prepared and ready to sleep. When you do not get enough sleep, are sleeping at the wrong times, or have poor quality sleep, you are going to feel tired and not alert. Sleep deficiency can interfere with work, school, driving, and social functions. Children who are sleep deficient might be overly active, have problems paying attention, misbehave and their school performance can suffer. Sleep deficiency also is associated with an increased risk of injury. Getting enough sleep that is quality in nature at the right times is vital for you mental health, physical health, quality of life, and safety. As you can see from this article, sleep deprivation and sleep deficiency are not the same thing. If you feel like you are not getting the proper sleep you need, you need to get properly diagnosed so you can function properly throughout the day. Sleep deprivation is only when you are not getting enough sleep. Sleep deficiency is when you are not getting enough total sleep and not enough of each type of sleep. If you are snoring a lot, you are more than likely have some type of sleep deficiency that needs to be treated property.